I like this post by Colin Campbell at GamaSutra, because I don’t think we need the publishers. Not to say that Colin is wrong about anything, he is absolutely correct, and his analysis of what a publisher is and what a publisher does is spot on. And I bow to his great knowledge of game creation. The use of Minecraft to make the point is exactly where I would have gone myself. However, when it comes to ‘disrupting technology’ and new companies, I don’t think his ideas hold true over the long haul. 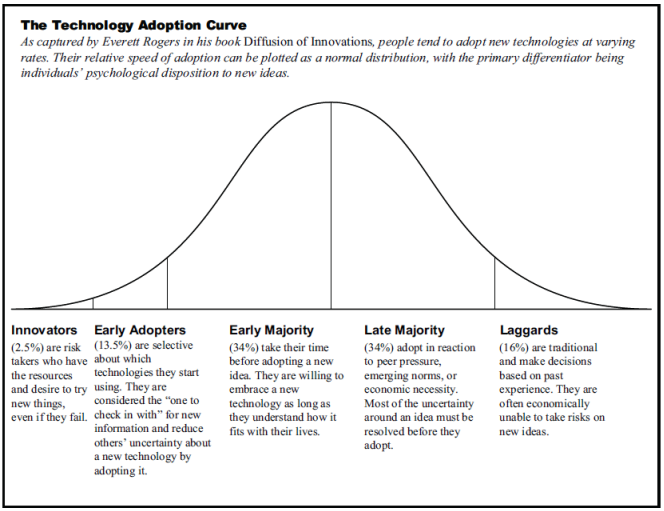 The nature of disruptive technology is such that a few small successes with something new stack up till the early adopters become early majority, then the late majority, and finally the laggards. Internet based publishing is such a disruptive technology which will conform to the Technology Adoption Curve. Minecraft, Jonathon Coulton, even Penny Arcade are self publishers. The number is only going to grow. Internet publishing is still in the “Innovation” Stage. Which doesn’t mean that I think Publishers will inevitably fail. Good companies with smart people will continue to be good companies with smart people. Bad companies will, and should fail. Will self publishing be the future for the AAA 50 million dollar titles? Not any time soon. But what will happen is something more like Minecraft and Mojang. Self publishing game companies will become more numerous and eventually overtake the big guys. But its a long way off from where we are now. Game design document? How about ‘game bible’?